Cambrian Safaris Tours01974 261425work Tour GuideCambrian Safaris provide excursions into the heart of the Cambrian Mountains in a Land Rover Discovery. The tours are designed to be flexible and the Mid Wales area is beautifully diverse for spectacular touring and fantastic views, scenery, local history and wildlife. Tours of the 'Hinterland' - Ceredigion uplands including locations used in the BBC series 'Y Gwyll' ('Hinterland'). Tours of the 'Picturesque' historic estates of the Ystwyth Valley and surrounding area. Tours of the Cambrian Mountains byroads and the Elan Valley. Tours can include a selection of old mines, Churches and Chapels or other historic sites and will always pass a variety of small lakes and reservoirs. 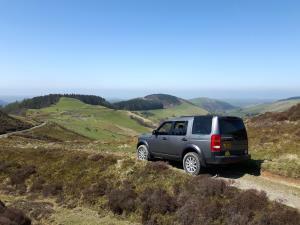 Cambrian Safaris provide excursions into the heart of the Cambrian Mountains in a Land Rover Discovery. The tours are designed to be flexible and the Mid Wales area is beautifully diverse for spectacular touring and fantastic views, scenery, local history and wildlife. Prices depend upon number of people, choice of tour and start point. see https://www.cambriansafaris.co.uk/tours for a price guide. We will pick you up from your accommodation or arrange a meeting point.